Since the 1950s, the peninsula of Coney Island has experienced a precipitous decline in its popularity, with its famous amusement parks closing one after the other, leaving only a leisure center and an aquarium built in 1957 by Robert Moses. In the framework of the urban plan for this now disjointed area, the Wildlife Conservation Society launched a competition in 2006 aiming to transform Coney Island into a cultural and educational destination focusing on environmental issues. The winning prize went to Ruiz-Geli, who proposed a unifying structure connecting the aquarium to the parking areas, boardwalks and circulation paths, all of which were spaces that had previously been disconnected. On one hand the architect designed a structure of 450 x 150 m covering the entire area of the aquarium and the adjacent buildings and, on the other, new north/south and east/west transportation routes. The structure is similar to a stretched canvas cloth, both light and interactive and designed in collaboration with the architect and engineer Frei Otto. 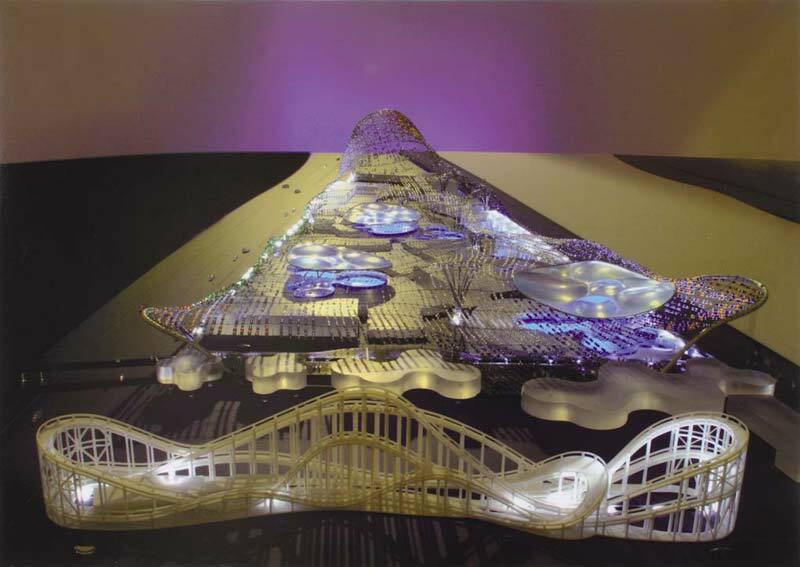 It is made up of a network of over 40,000 LEDs that store the energy from sunlight and then light the building at night, reminiscent of the magical spectacle of the Dreamland theme park. For Ruiz-Geli, it is not a roof or a covering, but rather a performative empathic skin that reacts to the constantly changing atmospheric conditions of the site. Thus, the visitor is immersed in a humid aquatic landscape, with salt air, sunshine and shade. More precisely, the network of cables supported by steel masts was designed like the skin of a fish. The study of marine life helped to foster correlations between the way an epidermis with a scaly structure interacts with water and the architecture’s performance, which responds to its environment by filtering, protecting and regulating the temperature.